A quality of imagination and individuality expressed in one's actions and tastes. We know that you put a lot of effort into getting your doll's STYLE just right. We feel the same way. We spend a lot of time working on our Lee & Pearl® sewing patterns for dolls. But clothes can only be one part of any look  of any STYLE. When we first saw 2016 American Girl® Girl of the Year® Lea Clark® and her beautiful tan skin, hazel-green eyes and bright tropical wardrobe, we knew that she needed a wardrobe of fun, beaded jewelry to match her distinctive style! So we sprang for an in-store ear piercing for our doll, and got her AG-brand set of brightly colored stud earrings. Lea's earring set, like many American Girl® earring sets, came with decorative attachments that can be slipped over the stud earring posts, turning the simple studs into glamorous, dangling beaded earrings. At Lee & Pearl, we LOVE this kind of easy option for dramatically different looks. We were also charmed by the thought of using earring projects as technique tutorials  taking advantage of their small size, material and time commitments to quickly and easily teach essential skills for making doll jewelry for lots of different dolls. So we set to work, and this downloadable PDF craft guide was born. 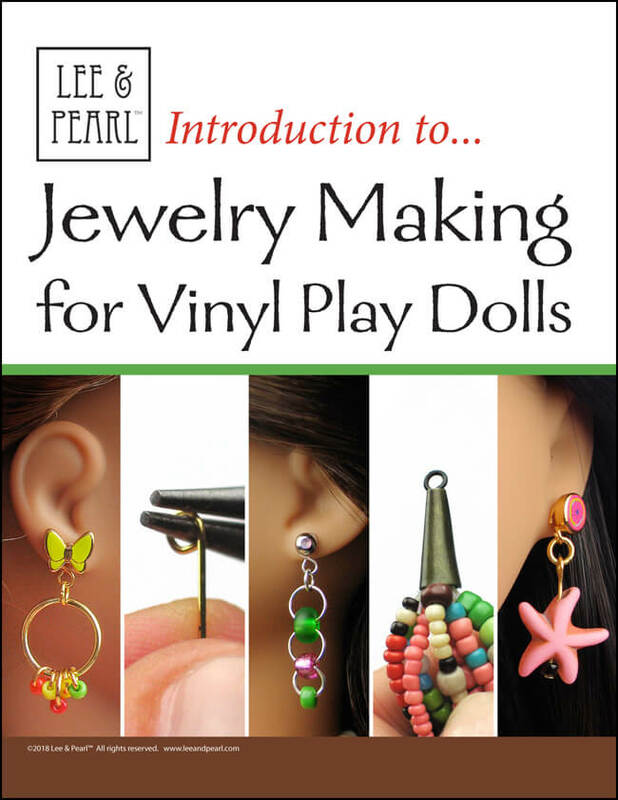 And now you too can learn to make scaled-down earrings, bracelets and necklaces, to fully explore your doll's individual style! Follow this NEW & IMPROVED eBook from technique lesson to technique lesson, as you learn how to use each of the basic jewelry making tools, while exploring a wide range of techniques and materials. As a bonus, we'll show you how to pierce your own doll's ears for either large, AG-size studs or for ordinary human-size earrings  and we'll direct you to the proper attachments to use with either style. Work your way through the book, and you will be a master of doll STYLE  for 18 Inch / American Girl® dolls, or for any doll! And guess what? All of these projects for doll jewelry can be made as PERSON SIZED accessories as well! Just swap in earring hooks from the craft store for the figure eight attachments and you can make your own glorious hoops, dangles and pendants  as well as bracelets, necklaces, and anything else you please! Learn how to make the large holes that fit American Girl®-brand stud earrings  and also small holes that fit human-sized stud earrings. Get started with jewelry making pliers, jump rings, head pins and beads. Learn to open and close simple jump rings  the most basic jewelry making skill. Connect multiple jump rings and add beads to build chandelier earrings and dangling hoop constructions. Create your own essential wire shapes using round-nosed pliers. 7. MIX JUMP RINGS, BEADS AND HEAD PINS  AND THE SKY'S THE LIMIT! Mix and match the basic techniques to create our shell-hoop-and-bead design, or create your own unique designs. Make boho-fabulous feather earrings using a few more supplies from the jewelry-makers arsenal  crimp beads and crimp bead covers. Make simple and fun doll bracelets with elastic beading cord, then add clasps and crimp beads to make single-strand doll necklaces. Finally, add head pins and cone beads to make glorious, cascading, multi-strand doll necklaces. As always, Lee & Pearl's photo-illustrated directions make each step and each technique lesson as easy as possible.